We’re leaving the UK today to return to Minnesota and my month of reviews of Speyside and Highland whiskies is also almost at an end. Here now is something you don’t see very often: a bourbon cask Mortlach. 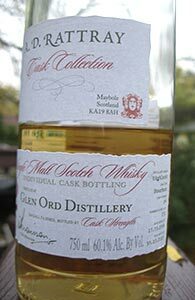 As you may know, Mortlach is generally associated with heavily sherried whisky. Its whisky also has a pronounced meaty quality, which results from their use of worm tubs for condensation during the distillation process—less copper contact means more sulphur in the spirit. I’ll be interested to see what that manifests as in a bourbon cask. Let’s see how it goes. 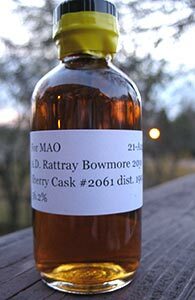 Another Bowmore from A.D. Rattray who seem to have a pipeline to a lot of excellent Bowmores from the early-mid 1990s. This is the period right after Bowmore’s notorious run in the 1980s, associated with soapy and perfumed notes. I’ve expressed my views about the nature of the talk around that period before and so will not repeat them here. 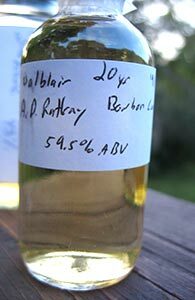 I’ve also noted that none of the 1990s Rattray Bowmores I’ve had have been anything less than good, and I’ve had another sherry cask from 1991 (an 18 yo, cask 2075) that was excellent. As this seems like it must be from the same distillation run I’m hoping #2061 was as good a cask as #2075 was. Let’s get to it. The number of Glen Ords I’ve tried does not pass single digits but I’ve liked every single one I’ve tried (the only ones I’ve reviewed so far are two of the older official releases, here and here). 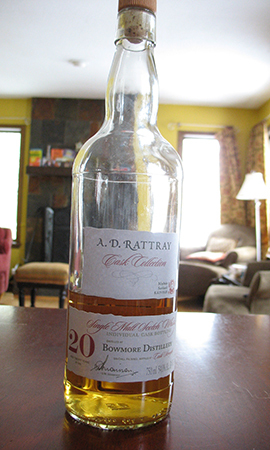 Will this 12 yo from A.D. Rattray keep the streak going? Let’s see. Note: This review was written up when the bottle was freshly opened. The accompanying photograph of the bottle was taken a couple of days later. 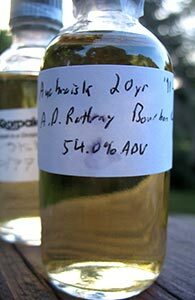 In the intervening period it was the star of our local group’s most recent tasting, and hence the much lowered level.